Diagnose and manage diseases using the newest information and research! 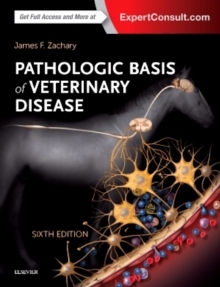 Pathologic Basis of Veterinary Disease - Expert Consult, 6th Edition provides complete, illustrated coverage of both general pathology and the pathology of organ systems of domestic animals. Addressing species from dogs and cats to pigs and cattle - and many more - this reference describes the lesions and pathogeneses of diseases, how cells and tissues respond to injury, and the interplay of host defense mechanisms with microbes and injurious agents. Updates include the latest scientific advances and diagnostic information. Written by a team of expert contributors, this book includes an Expert Consult website with access to the complete digital book plus thousands of images and guidelines for sample acquisition and for performing a complete necropsy. Complete coverage of both general pathology and pathology of organ systems is provided in one convenient resource, and includes the latest information available. Over 20 recognized experts deliver the most relevant information for the practitioner, student, or individual preparing for the American College of Veterinary Pathology board examination. UPDATED content on cellular and organ system pathology includes the latest insights into the science of inflammation, healing, and molecular carcinogenesis, as well as expanded coverage of genetics and disease. Over 2,100 full-color illustrations include color schematics, flow charts, and diagrammatic representations of disease processes as well as summary tables and boxes, making it easier to understand difficult concepts. Clear, up-to-date explanations of disease mechanisms describe cell, tissue, and organ response to injury and infection. Easy-to-follow organization for each systemic disease chapter includes a brief review of basic principles related to anatomy, structure, and function, followed by congenital and functional abnormalities and discussions of infectious disease responses, helping you apply principles to veterinary practice. Expert Consult website provides the reader with the complete digital text plus: An image collection; guidelines for performing a complete, systematic necropsy and appropriate sample acquisition for all organ systems; a comprehensive glossary; and an appendix of photographic techniques in veterinary pathology. NEW line drawings and schematic diagrams depict current concepts about pathogeneses and lesions of veterinary diseases. NEW! Essential Concept boxes in each basic pathology chapter break down long and complicated topics, making it easier to understand lesions and pathogeneses in the 'organ system' chapters.